The early 1990’s were a turbulent time in the world of endurance racing. At the end of 1992 the beloved and wildly popular World Sportscar Championship had met its unfortunate demise. Deliberate mismanagement and controversially costly rule changes had slain the beast which had threatened even Formula 1 for dominance. The fall of the WSC and its highly successful Group C prototype formula left a giant void, as there was no international series left to take its place. As a result the heavily restricted prototypes that remained were confined to a single event, the independently run 24 Hours of Le Mans. For many a privateer, the cost of buying and running a prototype for just one race was simply too great. In response the endurance racing discipline adapted to the times, accepting much cheaper production-based GT-cars after a decade of absence. The BPR Global GT Series took the WSC's place as the most popular endurance series. And so, from the fresh ashes of the WSC, the BPR Global GT Series was born in 1994. Founded by Porsche Carrera Cup official Jürgen Barth and Venturi Cup organizers Patrick Peter and Stéphane Ratel, the series was aimed at privateers with limited budgets. The focus was on relatively standard road going sportscars, which would face-off on an international stage. The championship was made up of a total of eight rounds, six of which were in Europe and two in Asia. With homologation requirements playing a minor role, it was relatively easy to enter a car to your liking. Cars could be entered into four categories, starting with the almost showroom stock GT4, and ending with more specialized machinery in GT1. Due to the one make Cup-series origins, the field was initially mostly made up of the Venturi’s and Porsche’s. The series’ instant success quickly expanded and diversified the grid though, with machines from Ferrari, Lotus, Honda and Chevrolet also joining the fray. The amazing A110 rally car propelled the small company to world fame. In the vacuum left by the WSC, the BPR Global GT Series took the center stage almost immediately. Its success caught the attention of legendary French specialty sports car manufacturer Alpine. The illustrious company had seen amazing successes in rallying by winning the first ever World Rally Championship in 1973. Sadly, that same year saw Alpine absorbed by Renault after being hit hard by the energy crisis. As a Renault subsidiary Alpine had already conquered Le Mans with the innovative turbocharged A442B prototype in 1978, but recently the company had fallen on hard times once again. During the 1980’s the association with Renault had gotten too strong, resulting in the brand’s sporting image being diminished by Renault’s dull reputation. 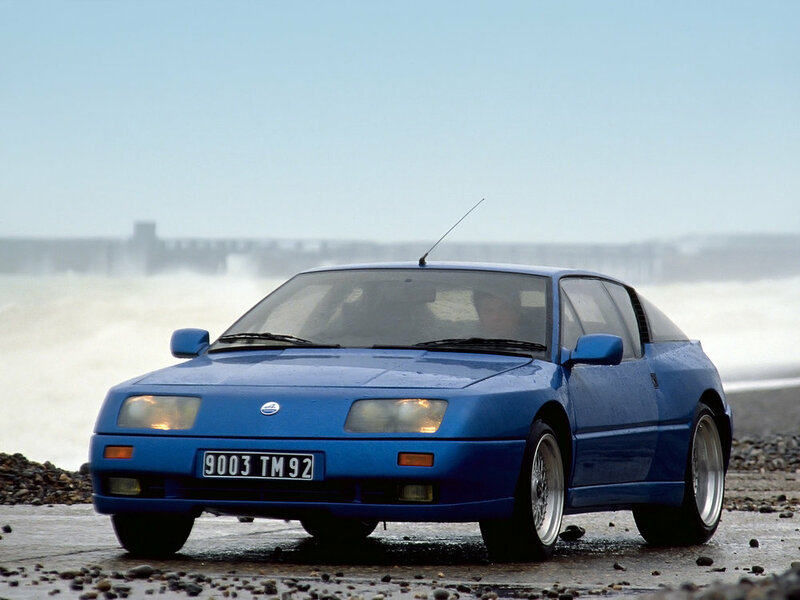 Sales of the Alpine-Renault GTA were consequently very poor, making it obvious something had to be done. Despite its official designation, the GT2 car was still based on the older GTA. For 1991 the Renault GTA would receive a facelift and a name change to A610, hearkening back to the classic Alpine naming scheme. With the name change and facelift Alpine hoped to regain some of its former sporting identity, but progress was slow. It seemed buyers had had enough of the quirky fiberglass sportscar. To keep the public interested until the A610 arrived, Alpine released the limited edition GTA Le Mans. The updated car featured various performance upgrades, but most distinctively gained a widebody and more robust fixed headlights. Just 325 of the cars were built, coincidentally enough to homologate it for BPR competition. The PRV V6 hung all the way over the rear wheels. The resurgence of European GT racing gave Alpine an incentive to try and improve its image through competition. To this end, one of the GTA Le Mans shells was given to Legeay Sports Mecanique, a racing engineering firm. LSM was tasked with modifying the Le Mans into a GT2-class machine, taking on the likes of the Porsche 964 Turbo, Ferrari 348 GTC-LM, Lotus Esprit Sport 300, Venturi 400 GTR, Callaway Corvette and Honda NSX. Right away there was a bit of an issue. Although the A610 handled well for a sports car, like all Alpine’s it was still rear engined. The car’s layout was similar to that of Porsche’s famous 911, which made it incredibly tail-happy. In addition the A610 used a relatively top heavy V6 engine instead of the Porsche’s much lower flat-6. The V6’s higher center of gravity further hampered balance, which gave chief engineer Patrick Legeay plenty to think about. Legeay widened the already buff Le Mans shell even further, and fitted a giant rear wing. Further aerodynamic improvements were made to the front of the car, and the rear valance was left partailly open to allow the hot V6 to cool down more easily. In the process weight had been brought down from a hefty 1415 kg (3119 lbs) to a healthier 1080 kg (2380 lbs). The car retained its rather outdated 3.0L turbocharged PRV V6. Designed in the late 1960’s, the PRV was originally intended as a V8 for Peugeot, Renault and Volvo’s luxury range. The 1973 fuel crisis made the engineers cut off two cylinders, which left them with an unconventional 90 degree odd-fire V6. Because of its mottled history, the old mill required extensive modifications to get up to speed with the young’uns. A dry sump oiling system, custom made camshafts and other minor refinements gave the old unit some more pep, but the kicker was the addition of a second turbocharger. With two Garrett AIResearch T3’s breathing on the PRV, power increased from paltry 280 to a masculine 440 horsepower. Torque was also bumped up significantly from 412 nm (303 lb ft) to 509 nm (375 lb ft). The increased oomph was dealt with by a 5-speed manual transmission provided by Sadev/Hewland. The finished machine was christened A610 Biturbo despite its GTA Le Mans roots, and was entered into its “home event”, the 1994 24 Hours of Le Mans. The car would be driven by an all-French squad of Le Mans rookies: Benjamin Roy, Luc Galmard and Jean-Claude Police. The trio would have their first taste of the legendary event at the traditional Le Mans Test day. The test served to introduce new drivers to the track, and if necessary allow them to clock the required hours of night driving. The second purpose of the test was to possibly weed out any new cars deemed too slow to safely compete. Sadly, the team encountered mechanical woes, which saw the car sidelined for the day. Luckily the car’s lack of reliability seemed to be cured for the race proper, and the team started its assault on the leaderboard. Eventually the A610 recorded a fastest time of 4:28.530, eleven seconds behind the leading Callaway Corvette. Although the Alpine’s pace was far from leading, it still placed 13th out of 22 GT2 starters. With the technical difficulties from the Test still fresh in their minds, the team was relieved by the A610’s commendable performance. Driver feedback was also positive. Legeay was ready to take on the established order. However, the struggle had only just begun, with 24 long and grueling hours left to run. The Alpine battling with its two main rivals, Ferrari 348 and Honda NSX. As the race unfolded the French 911 slowly found its rhythm. Somehow, the unproven machine managed to give its more seasoned competitors a serious run for their money on race pace. However, faced with an armada of Porsche 964 variants and the factory Honda team, things looked rather bleak from the Legeay side of things. Porsche and Honda were companies famous for ironclad reliability and terrific build quality, thing which Alpine was rarely identified with. Yet it wasn’t the two major players who would steal the show. The five liter Callaway Corvette quickly pulled out to an enormous lead, but encountered brake problems as night fell. The big American brute met its end at the Porsche curves a few hours later after running out of fuel. After receiving outside assistance, the Callaway was disqualified. The American’s failure meant the GT2 category was once again open to the fleet of Porsche’s, with a trio of naturally aspirated RSR’s leading the way. Honda’s NSX failed to make an impression, as its experimental semi-automatic gearbox refused to work properly. All the while the A610 diligently racked up the laps, ready to pounce. Inexplicably, the notoriously unreliable car was running completely trouble-free, passing countless stricken Porsche’s and Honda’s along the way. Further motivation came from beating the mid-engined Venturi cars, as they too were powered by the venerable PRV engine. In the process the Alpine proved the potential of its rear engined layout. As the sun rose above the usually peaceful French countryside, it revealed the Alpine still going strong. In the closing stages of the race it had taken 5th position in GT2, behind the three Porsche’s and the Ferrari 348 GTC-LM. In that order, the cars crossed the finish line. Legeay and Alpine had done it. Not only had the A610 completed the full distance, it had finished an incredible 5th in class and 13th overall. The program had been a resounding success. The A610 Biturbo was part of a last ditch attempt to save one of the motoring world’s most prolific builders of lightweight sportscars. The traditional rear-engined machines were losing out to cheaper and more advanced mass produced competition in the marketplace, as more and more major manufacturers started producing sporty cars. On the track the experience was no different, but the A610 somehow persevered. With its dying breath, Alpine had still managed to make an impression at Le Mans with a competitive finish. The A610 Biturbo’s impressive performance at Le Mans proved to be the iconic marque’s last hurrah, as an unrelenting lack of sales sealed its fate. The Alpine name was abandoned in 1995 after A610 production ended. Instead, the Dieppe factory started production of the Renault Sport Spider.